The Caribbean island nation of Antigua and Barbuda is again considering how to make the United States comply with a World Trade Organization ruling over online gambling that went in Antigua’s favor a decade ago. 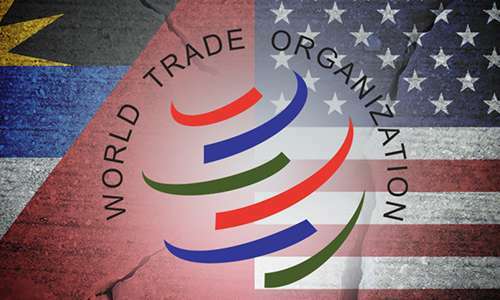 The latest development in this long-running trade battle occurred on Friday, when Antigua’s ambassador to the WTO, Sir Ronald Sanders, told the organization’s Dispute Settlement Body (DSB) that the country may formally ask the WTO to appoint a mediator in the hope of resolving the 15-year-old dispute. Antigua has been entitled to $21 million annually in abrogated-property rights dating back to 2003, when the dispute was first brought before the WTO, according to a ruling issued by the WTO’s dispute-settlement body in 2008. That ruling gave Antigua the rights to manufacture and sell intellectual property owned by US companies without having to pay royalties back to those US-based companies, the $21 million figure being the amount of royalties each year that Antigua could ignore. However, the tiny Caribbean island country has not taken that nuclear step, despite threats over the years to do so; the island receives other aid from the US and fears that the other aid would be cut off in retaliation. That’s left Antigua unable to enforce its settlement victory; previous ultimatums have fallen on deaf ears. “Antigua and Barbuda has not acted on that authorization in the hope that the United States would agree to a fair and reasonable settlement. It has not done so because we continued to hope that a sense of justice and fairness would prevail. But we are now losing all hope,” Sanders told the DSB on Friday. Sanders told the DSB’s attendees that the US’s violations of the 1998 GATS [General Agreement on Trade in Services] pact “has caused trade losses of US$315 million to Antigua and Barbuda’s small economy over the last 15 years”. The US long tried to argue that the pact was unenforceable due to the US’s moral and religious opposition to online gambling, a claim that was previously laughed out of the WTO proceedings due to the US’s own long-prominent gambling industry. The US’s 2006 UIGEA act was an additional, open defiance of its GATS obligations to other WTO countries, not that the US cared. The beginning of the UIGEA’s enforcement in 2007 quickly crippled Antigua’s online gambling industry, which at its peak early last decade accounted for a third of the country’s total GDP. It’s also fair to acknowledge that Antigua’s online services were lightly regulated — if not quite the pure rubber-stamp type of offerings setting up shop at in Curacao or on Canada’s Kahnawake Reserve — meaning that not all of the lost industry traffic was necessarily a bad thing for consumers. Nonetheless, many reasonably reliable operators found their access to the US market crippled, and Antigua’s working class suffered a significant blow as many operators moved elsewhere and refocused their marketing efforts. The US’s representative attempted to counter Sanders’ push toward mediation by noting that the US has made two previous settlement offers. Both of those were valued at less than $1 million in “other considerations”, however, and are largely considered bad-faith efforts. Both of those also occurred during the Obama administration, while the current Trump administration of the US’s Trade Representative Office has, allegedly, not even bothered to respond to Antigua’s continuing inquires about the dispute.